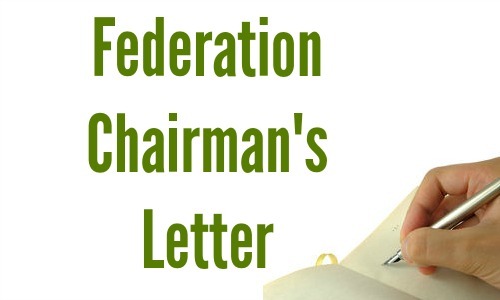 Three years have gone by very quickly, and it seems strange to think this is my last letter to you as Chairman of the Federation. Although we don’t have a rule concerning length of tenure in this role, it feels to me the right time to step down, and allow someone else the opportunity to head our Board of Trustees. A great deal has happened during my term of office including our Centenary, and I have been immensely fortunate to have worked with so many excellent people as we have done our best to meet the challenges facing our organisation both locally and nationally. I owe so much to my fellow Trustees, Advisers and our wonderful office staff. Travelling around the Federation meeting as many of you as possible has been a great joy, and confirmed my belief that there is seemingly very nearly a WI for everyone. I have made so many friends and learnt of some amazing achievements and humbling sacrifices. The welcome has been so warm and the support so great, and I continue to be a vey proud WI member, eternally grateful to those who founded our organisation over 100 years ago. Although leaving the Board of Trustees, I will be serving on one of the sub-committees, and look forward to seeing many of you at future federation events. With all good wishes and many thank for all your support. The start of another year, and as WI members there is so much we can do to make a difference. For example, at the ACM in Tunbridge Wells on 19 March we are asking WIs to bring bags of products to be donated to The Hygiene Bank which distributes toiletries to people struggling to afford even basics such as soap and sanitary towels. We can also make a difference by taking part when we have the chance to vote, something which women fought long and hard for. Last year marked 100 years since the first women in Britain got the vote and I'm so pleased that Jane Robinson, author of "Hearts and Minds, the untold story of the Greta Pilgrimage and how women won the vote" will be one of the speakers at our ACM. It is so important that we don't forget how excluded women used to be from decision making at all levels and as WI members we should not pass up opportunities to be involved. Voting on resolutions will help to ensure the continuation of that great WI tradition of helping to try and improve society by drawing attention to issues that concern us and doing our bit, however small, to make a difference, Voting in the elections for the NFWI board enables us to have a say in how the WI is shaped going forward, and that it delivers what we want from it. As members of the largest women's organisation in the country we have a voice that is listened to, and we must ensure that voice continues to make itself heard. But we can also make a difference to others within our own WI. I know from personal experience how much WI membership offers in ways both large and small, with the support and friendship offered within one's own WI probably the greatest gift of all. I am so proud of being a WI member, and as West Kent Federation embarks on its second century, feel sure it will continue to make a difference to other peoples' lives. Hanging proudly on the wall of the Committee Room at Ethel Hunt lodge is the certificate presented to us by NFWI to mark 100 Years of the West Kent Federation. It is a lovely reminder of what has been a very special year for West Kent members and, as the year draws to a close, I have many memories to look back on. At the garden party in Hawkhurst in May the weather threatened to do its worst but it kindly gave us a dry spell for the afternoon. Hats were displayed to full advantage, the tea was delicious and the entertainment gave a lot of pleasure. At Sidcup talented members showed off their theatrical and musical skills at two performances. The audiences were delighted and the rousing singing of Jerusalem certainly brought a tear to my eye. Aylesford showed another side of the talents of WI members with the fabulous display of upcycled cushions and the wonderful flower arrangements. All these events, not forgetting our exhibition at the Maidstone Museum, happened thanks to the teams of WI members who organised them. Likewise the smaller but hugely enjoyable celebrations I have also had the privilege of attending at both group and institute level. We would be lost without these marvellous ladies. As I write this letter our Christmas celebration at All Saints Church Maidstone is yet to take place, but I am sure it will prove to be a fitting end to this very special year, which has left me prouder than ever of being a WI member. With so much gloomy news everywhere it's lovely to have good news from the West Kent Federation with the Advisers looking to open our 182nd WI. Our WIs cover an extremely wide area from the Thames in the north to Hawkhurst in the south, the Surrey border in the west and the Hoo peninsula in the east. The Trustees and Advisers are seeking to ensure all of our West Kent WIs receive a visit, but as you may gather from the numbers involved this is not going to be a speedy job. On the visits I have made so far, I never cease to be amazed by the warmth of the welcome and the variety of activities. I have heard about lunches and teas, trips to cinemas and theatres, craft activities and events involving links with the wider community. All WIs are different in large or small ways, something I see as a strength, but what they all have in common is providing friendship. With loneliness and its associated problems, so common in our society, the role the WI can play in helping alleviate such difficulties cannot be overstressed. I am always so pleased when I hear from members of the support their WI has provided them with in difficult times and never cease to be proud of belonging to such a splendid organisation. There is certainly never a moment when I could describe my role of Federation Chairman as dull, and I'm hugely grateful to the wonderful team who provide with so much support. All are extremely hard working, and I'm delighted to announce that their number is increasing thanks to Amanda Breach of Petts Wood WI who has accepted co-option onto the Board of Trustees. It is great news to have someone on the Board from further north in the Federation, and also from one of our newer WIs, Petts Wood only having opened in 2015. I can't believe how quickly this year has flown by and that it is Autumn already. As a finale to this, our Centenary year, we will be holding a celebration in the beautiful surroundings of All Saints Church Maidstone on Tuesday 18th December. There will be an opportunity to join in well-loved carols, listen to the glorious sound of hand bells and enjoy readings from a wide variety of sources both familiar and less so. I do hope as many of you as possible will come as we can seat over 1000 and it would be lovely to have such a great climax to this very special year in our history. Earlier in the year I visited the Victory Hall at Balcombe in West Sussex, the village where Lady Denman lived. The hall was built as a memorial to those who fought in the First World War and is decorated with wonderful murals which includes a depiction of Lady Denman herself. If you happen to be nearby do pop in to see them. The reason I was at the hall was an Inter-Federation meeting attended by 13 Federations from the southern half of England. Accompanied by our Treasurer Gill Neville it was an excellent opportunity to find out what other Federations are doing and to discuss a wide variety of issues. I always think any opportunity for WIs to meet up either at Group meetings or by accepting invitations to birthday parties etc is incredibly useful as well as enjoyable. It is in this spirit that Trustees and WIAs are seeking to visit every WI as part of a four year rolling programme. Four years may seem quite a long time-frame, but we do have 181 WIs with another in the pipeline. Our newest WI is The Ladies of the Manor at East Sutton Prison. I was thrilled to learn that at their first full meeting since their formation they received visitors from neighbouring WIs keen to support this new WI. It has been opened as part of a programme to help women prepare for their return to the world outside. Centenary events are almost behind us although don't forget the Carols at Maidstone in 18 December. Federation sub-committees are now busy planning next year's programme and indeed in some cases that for the year after. Finding suitable venues, particularly for our big Hone Economics and Art & Craft days is proving troublesome due to a variety of issues with some we have used before. We do try awfully hard to find halls that are accessible to as many of you as possible and constantly seek new places to go. We are very grateful to those of you who have already passed on suggestions, but more are always welcome. Please don't forget it is your WI and your input and ideas are always welcome. Nobody could accuse West Kent Federation of being quiet and dull in it's Centenary year. As I write to you it is hard to decide, with so much going on, what to mention. Our trip to the Annual Meeting in Cardiff proved an excellent opportunity to catch up with old friends, make some new, and learn about NFWI plans. Dame Stella Rimmington and Huw Edwards were both good speakers and, along with other Federation Chairmen, I was presented at lunchtime with a certificate from NFWI marking our Centenary. The garden party at Hawkhurst was a lovely afternoon with the rain kindly holding off for the duration. Superbly organised by Caroline Davis and her team, we were delighted to welcome NFWI Chair Lynne Stubbings and the Mayor of Tunbridge Wells. Next in my diary is the Art & Craft Day at Aylesford. All of these special events to mark our Centenary have been long in the planning and we all owe a huge debt of gratitude to the many volunteers involved in making them happen. Elsewhere in this edition of the West Kent News you will see a piece by the Chairman of the WI Advisers, Jean Gibbins, about our intention for every WI to receive a visit from a WIA or Trustee at least once in every four years (we have 180). As I know from personal experience paying such visits are always enjoyable and informative experiences. I never cease to marvel at the scope and variety of activities that go on, all contributing to what I see as one of the greatest strengths of our movement - there is no such thing as a typical WI - thus making it possible for everyone who so wants to find a WI that is for them. It has been a privilege in recent months to attend a number of special WI celebrations both large and small. The Federation darts final at Tovil was an exciting evening with not only the competitors and their supporters present, but also members of other WIs. Inevitably there were winners and losers but a good time was had by all with a wonderful spirit of sportsmanship shown throughout. The Centenary Show at Sidcup was another marvellous day with some amazing talent displayed and a very happy atmosphere on what was an extremely long day for both performers and hardworking PALS members and their volunteers who made it all happen. I've also attended parties helping WIs to celebrate special anniversaries including 50 and even 100 years since their formation. Another cause for celebration and equally important has been members stepping forward to serve on their WI committee when a dearth of volunteers has made closure seem inevitable. We owe these ladies huge thanks for without them WIs would cease to exist. Yet more wonderful celebrations are in my diary throughout the summer and I look forward to attending them and meeting with as many of you as possible. So much is happening in West Kent Federation over the summer. As well as our major Centenary days, sub-committees have organised many other events for members to attend. I am so grateful to the hardworking ladies who are arranging everything, thus ensuring we have a vibrant and active Federation we can be proud to be a part of. I would also like to take this opportunity to put on the record the deep gratitude of all the Board of Trustees to our marvellous office staff at Ethel Hunt Lodge. We owe them an immense debt for all that they do, particularly over recent months as we have sought a replacement secretary. Always willing and cheerful, we would be lost without them. Membership of the WI can be very important in people's lives. I have recently read a remarkable book by Tessa Dunlop entitled the Century Girls. The final word from the women who've lived the past hundred years of British history. Two of the women featured speak of the amazing role membership of the WI has played in their lives; teaching them new skills and inspiring confidence. But the WI can only continue such a role if members continue to step forward to serve on their WI committee and thus keep them running. May is the month when all WIs in West Kent elect their committee for the forthcoming year. New members are always hoped for so if you haven't already served why not step forward this time. As it was for the two ladies featured in Tessa Dunlop's book it could be the start of a new chapter in your life. We are certainly very fortunate on the Board of Trustees to have three new members come and join us. Whilst sad to say goodbye to Gill Bowden and Sheila Fitzgerald we are delighted to welcome Gill Brown, Sarah Sudlow and Paula Bates to our ranks. I would also like to say a big thank you to Gill Neville for stepping forward to take on the role of Federation Treasurer. In such a busy and momentous year for the Federation it is excellent to have so much support. The ACM always provides a wonderful opportunity to meet up with old friends, meet some new ones and to pass on news. There was certainly lots of news for the federation to relate including all about the amazing events taking place to mark our centenary. We also spoke of some recent changes in personnel. Samantha Milns, one of our two federation secretaries who has worked at Ethel Hunt Lodge since 2007, decided to move on in March, and Sue Hollings, joint editor of the West Kent News, decided to stand down from the role although is still continuing to be one of our hardworking advisers. Gill Bowden who has served a federation treasurer for six years decided to stand down both from this role and from being a trustee, and likewise Sheila Fitzgerald. Everyone has contributed so much to the life of West Kent and we are sad to see them go and very grateful for all they have done, but fortunately three new members have come forward to serve as trustees. We are delighted that Gill Brown, Sarah Sudlow and Paula Bates have come to join us. The federation is only kept alive by members coming forward to serve in it on both large and small ways. There are always vacancies to be filled and we would be delighted to hear from anyone interested I coming to observe at either one of our sub-committee meetings or at Board of Trustees to find out what goes on and if it might be for them. Do get in touch, we would love to hear from you. With the start of March life at Ethel Hunt Lodge has suddenly accelerated as we head towards our first major event of the year, the ACM at Tunbridge Wells. I'm really looking forward to hearing our two speakers Floella Benjamin and Hilary Howarth, as well as seeing so many of you. I trust you too will enjoy the opportunity to visit the stalls and stands, learn about our future plans and events, enjoy the singing, meet up with some old friends and perhaps make some new ones. The Board will be using the meeting to advertise our idea of how to cut back on the amount of non-recyclable waste that we create. Currently larger events such as federation days mean we have to use paper cups as sheer volume of numbers renders the use of china impossible. At present we do not know of any paper cups that are both suitable for hot liquid and fully recyclable, so our proposal is that if possible members bring their own drinking containers which we can then serve their tea or coffee in. We will of course still have paper cups available for those who haven't brought their own, but it would be great to try and reduce the number we finally have to put in the non recycling bin. Finally, if anyone knows of a suitable fully recyclable cup that we can use the please contact us at Ethel Hunt Lodge.